Waterford Township in Michigan has told the federal government it will not resettle any Syrian refugees within the township’s borders. The town’s trustees unanimously (7-0) passed a resolution on Oct. 24 saying the township would not take in any refugees until the government’s Refugee Resettlement Program was reformed. “We’ve got so many people who need jobs in Waterford, what are you gonna do with the refugees that come in here? You’re gonna feed them, you’re gonna clothe them, you’re gonna house them. 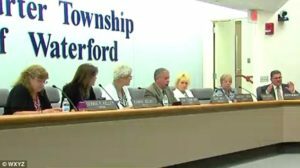 We can’t afford that; we’ve got veterans that need help,” one Waterford Township resident present at the Oct. 24 meeting told WWJ television. Waterford Township, population 72,000, is located in the geographic center of Oakland County, population 1.2 million, which is a suburban Detroit county. Oakland County Executive L. Brooks Patterson has said he intends to sue the federal government for resettling refugees in the county while failing to comply with the “consultation clause” of the Refugee Act of 1980 that requires the federal government and the director of the Office of Refugee Resettlement to consult with state and local government officials prior to the placement of refugees within their jurisdictions. Democratic presidential candidate Hillary Clinton has vowed to increase the number of Syrian refugees admitted into the United States by 550 percent.